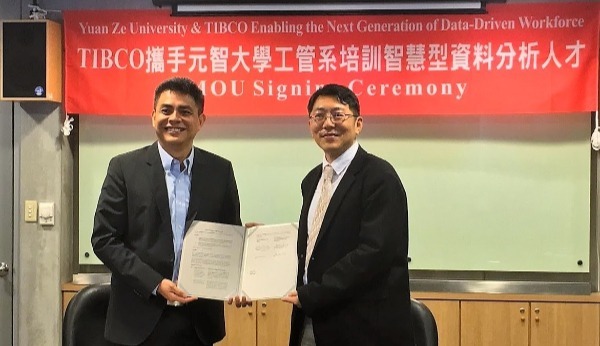 TIBCO Software Inc has announced its plan to collaborate with Yuan Ze University in Taiwan to expand data analytics capabilities and knowledge in the field of industrial engineering and management. TIBCO Software Inc., a global leader in integration, API management, and analytics, today announced its plan to collaborate with Yuan Ze University in Taiwan to expand data analytics capabilities and knowledge in the field of industrial engineering and management. As part of the Memorandum of Understanding (MOU), Yuan Ze University and TIBCO propose to jointly engage students through workshops, research capabilities and other practice-based training to empower students with advanced analytic skills essential for their careers after graduation. The planned collaboration between TIBCO and Yuan Ze University is designed to support students and teachers from the Department of Industrial Engineering and Management. Under the arrangement, the TIBCO Spotfire platform of solutions will be available for all of students and will receive hands-on practice with TIBCO tools and support for various data analytic techniques to understand and implement for future research and employment. Taiwan government is highly committed in developing its manufacturing sector, thus providing the industry with the value-added support. “The manufacturing industry is known to adhering to complex processes and, to housing huge machineries and equipment. Our solutions can help manufacturers in identifying bottlenecks in their processes, taking proactive action in response to developing situations, and increasing operational system awareness are all key themes in sensor-driven manufacturing monitoring,” added Ries. TIBCO Spotfire solutions will be used in five key areas at the Yuan Ze University’s Department of Industrial Engineering and Management. They are smart production, mobile technology and cloud computing, human factors in engineering and design, global logistics management, and big data analytics. Teachers and students can also use TIBCO’s advanced industry solutions to develop professional skills and knowledge in the area of postgraduate research capabilities. In addition, the Department of Industrial Engineering and Management at Yuan Ze University will also incorporate TIBCO Spotfire in professional information technology courses where students will have at least 10 hours of practical training. The courses are expected to open for registration in the first half of this year. By helping students master the use of this software through short, intensive courses, the adoption of TIBCO Spotfire in different research and applications will be accelerated. In addition to the partnership with Yuan Ze University, TIBCO has been working with various universities across Asia equipping students with the relevant skillsets to cater to the growing need of data analysts.